Irving was a naturalist, a specialist in botany and gathered in his home garden wild flowers that thousands of garden club members, students and botanists from many countries visited. He also made research and wrote on ornithology and wildlife in general. Died unmarried. Irving was listed in the 1920 census of Granby, CT, page 4A, line 13, age 64, as the head of the household (listed as married) with his sister Fanny, and cousin Mary. Irving was enumerated in the 1930 West Granby Village, Granby Town, Hartford Co., CT, federal census, page 13B. He was a single nurseryman, age 74. His sister Fanny H. was also in the household, age 72. In the town of Granby in the shadow of Bear Mountain and within a short distance of the picturesque Barn Door Hills lives Irving Holcomb, collector of woods, flowers, minerals, and stones. Mr. Holcomb will observe his seventy-fifth birthday next Monday. In his life of seventy five years, he has found his recreation and fun in studying the things of nature and amassing a collection which to the novice is bewildering by its size and multiplicity of specimens. He is one who has obeyed the poetic command, "Go forth under the open sky and list to Nature's teachings." Mr. Holcomb tells of his early experiences of collecting birds eggs and of how upon observing the distress of a pair of Pine Groosbeaks, a very rare bird in this vicinity, when they found that an egg had been taken from their nest. The distress of those birds caused Mr. Holcomb to return the egg and to give up collecting. It was then that he turned his talents to other things, the collecting of which, to use his own words, "would not hurt anything." Specimens of all the woods, seventy four, in number, known in this part of the country Mr. Holcomb has arranged in a cabinet built into the wall of his living room. Each specimen is about an inch and a half in diameter and shows the bark, a cross section, a diagonal grain and the flat grain of the wood. All of these he can call by their botanical name as he can also tell the name cones of the coniferous trees. In his collection of cones are many from different parts of this country, some as small as a thimble, others larger than a pineapple. Strange as it may seem the cones of the giant Redwoods of California are among the smallest. Many of these specimens have been sent to Mr. Holcomb by other collectors who have exchanged with him. In the same way he has acquired samples of woods not native to these parts, mahogany, ebony, cork, and others from the tropics. Passing to the two large cabinets where are stored hundreds of samples of minerals and stones, we find a wealth of materials, many of much value because of their peculiar formation and the intrinsic worth of the mineral. From the quarries of this vicinity are samples of copper from East Granby, iron from the Dyer mine in Canton and the mine in Salisbury made famous in Revolutionary war days, soapstone from Barkhamsted where it is related that the Indians used to fashion their crude dishes. Precious minerals from Western mines as well as gold from Nova Scotia are to be found. Lake Superior mines are represented with copper and iron. Mr. Holcomb's knowledge of these ores was once very valuable to him when promoters tried to interest him in a local copper mine by showing a sample of the ore to be found in it. He recognized the sample as coming from the Lake Superior region. Quartz crystals gathered locally also from Little Falls, N.Y., and more distant points are to be found. Very interesting are the exhibits of smoky quartz, one from Pike's Peak, being very good. Prized for its beauty and association is a sample of serpentine sent to Mr. Holcomb by the late governor Pennypacker of Pennsylvania. Mr. Pennypacker, we are told, had one of the most complete collections of this type of mineral ever made. Turning to the floral world Mr. Holcomb has been interested in ferns and orchids. It was pointed out that Granby is particularly rich in these flowers because here the northern and southern flora overlap and the terrain ranges from the fertile lowlands of the Farmington Valley to the hills several hundred feet high. Here have been found by Mr. Holcomb forty-one of the forty-nine species of ferns known to this part of the world. Thirty-two of the forty-one known orchids have their habitat here, some of them among the most rare. [S25] Hannah McPherson, Holcombe Genealogy, Page 191.1/Item A-8-1-10-10-2-7-8. [S714] Granby Naturalist, 4 September 1930. [S25] Hannah McPherson, Holcombe Genealogy, Page 191.1/Item A-8-1-10-10-2-7-9. Frank L. Holcombe was also known as Fred L. Holcombe. He was born in April 1861 at Granby, Hartford Co., CT. He was the son of Alson Holcombe and Candace Almina Holcombe. Frank L. Holcombe married Florence Roberts, daughter of Thomas Roberts and Laua Buckley. Japhet Holcombe died young. He was born at Granby, Hartford Co., CT. He was the son of Alson Holcombe and Candace Almina Holcombe. Shaney Holcombe was born at Granby, Hartford Co., CT. Shaney Holcombe was the child of Alson Holcombe and Candace Almina Holcombe. Clyde Holcombe was the son of John Albert Holcombe and Minnie Delbridge. Clyde enlisted in the US Navy, 1939, and was in Hawaiian waters in 1941. Married and had two sons. [S25] Hannah McPherson, Holcombe Genealogy, Page 179.1/Ite A-8-1-6-5-1-5-1-1-1. Delbridge enlisted in the US Navy and served in the Pacific. [S182] Social Security Death Index (on-line), Ancestry.com, SSDI, Ancestry.com, 542-18-5101. Blanche Holcombe was the daughter of John Albert Holcombe and Minnie Delbridge. Charles H. Burke was born on 4 April 1868 at Liverpool, England. He married Lucy Antoinette Holcombe, daughter of Grove Robert Holcombe and Sarah Ann Lyell. Lyell Burke was the son of Charles H. Burke and Lucy Antoinette Holcombe. John Robert Burke was the son of Charles H. Burke and Lucy Antoinette Holcombe. Dr. George Burke was the son of Charles H. Burke and Lucy Antoinette Holcombe. George was engaged by the Sou. Pac. RR hospital; in 1941 he went into service of the US Navy in its California coast camps and hospitals; went to Yard Dispensary at Pearl Harbor, April 1942 as a 1st Lt. and was there past May 10, 1943. 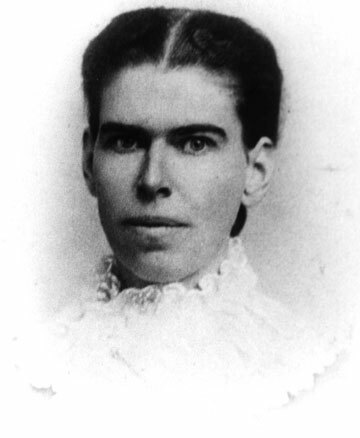 Kay Burke was the daughter of Charles H. Burke and Lucy Antoinette Holcombe. Kay was a nurse. Billie Burke was the daughter of Charles H. Burke and Lucy Antoinette Holcombe. Billie was a teacher in McGill, White Pine Co., NV, a copper mining camp. Thomas M. Mansfield was born in 1872. He married Kate Holcombe, daughter of Grove Robert Holcombe and Sarah Ann Lyell. Thomas M. Mansfield died in 1945. [S818] Edwin W. Strickland II, William Buel, 8-14, page 494. John Rice was born on 19 August 1843 at Blooming Grove, Richland Co., OH. He married Florence Nevada Holcombe, daughter of John Flavel Holcombe and Antoinette Casandra Thompson, on 30 July 1871. John Rice died on 7 June 1909 at Los Angeles, Los Angeles Co., CA, at age 65. Ernest Rice was born on 28 August 1875 at CA.1,2 He was the son of John Rice and Florence Nevada Holcombe. Ernest Rice died on 12 April 1960 at Yuba Co., CA, at age 84.2 Small of stature, is intensely interested in prospecting for valuable ores. [S807] Find A Grave, online http://www.findagrave.com, memorial ID 38416405. Mabel Rice was born in August 1879 at CA.1 She was the daughter of John Rice and Florence Nevada Holcombe. Hezekiah Holcombe III was born on 25 March 1773 at Granby, Hartford Co., CT. He was the son of Hezekiah Holcombe II and Chloe Pinney.2 Hezekiah Holcombe III was baptized on 13 June 1773 at St. Andrew's Episcopal Church, Simsbury, Hartford Co., CT. He married Orpha Roberts, daughter of Nathan Roberts and Rhoda Woodford, in 1791. Hezekiah Holcombe III married Elizabeth Pettibone, daughter of Gen. Chauncey Pettibone and Theodosia Hayes, on 21 June 1821. Hezekiah Holcombe III died on 19 September 1822 at East Granby, Hartford Co., CT, at age 49. He was buried on 20 September 1822 at East Granby, Hartford Co., CT.
[S25] Hannah McPherson, Holcombe Genealogy, Page 49.2/Item A-4-5-2-3-1-4. Samantha Holcombe died young. She was born on 20 January 1772 at Granby, Hartford Co., CT. She was the daughter of Hezekiah Holcombe II and Chloe Pinney. Susannah Holcombe was born on 30 January 1775 at Granby, Hartford Co., CT. She was the daughter of Hezekiah Holcombe II and Chloe Pinney. Susannah Holcombe was baptized on 9 July 1775. She died on 14 April 1864 at age 89. [S25] Hannah McPherson, Holcombe Genealogy, Page 50.1/Item A-4-5-2-3-1-5. Abraham was enumerated in the 1850 Granby, Hartford Co., CT census, age 73, a landlord. Milo was living next door. [S25] Hannah McPherson, Holcombe Genealogy, Page 50.1/Item A-4-5-2-3-1-7. [S807] Find A Grave, online http://www.findagrave.com, memorial ID # 14866790. Alexander Holcombe was born on 20 July 1786 at Granby, Hartford Co., CT.2 He was the son of Hezekiah Holcombe II and Chloe Pinney. Alexander Holcombe married Tryphenia Thrall, daughter of Oliver Thrall and Wealthy Latimer, on 15 March 1804 at Bloomfield, Hartford Co., CT.3 Alexander Holcombe married Ascenta Sadd on 17 February 1849. Alexander Holcombe died on 7 November 1853 or 1855 at Burritt Township, Winnebago Co., IL.4 He was buried at Winnebago Cemetery, Winnebago, Winnebago Co., IL. Alexander moved from Bloomfield, CT, to Albany, NY, where he chopped wood to earn money for removal trip to OH on which he carried on a bob sled his wife, young children, feather beds, pots, pans, etc. Henry Lyman Holcombe, his nephew, when sixteen years old drove the sled to Albany for him. He transferred en-route to Trumbull Co., OH, from the sled to a lake boat which shipwrecked. Alexander appears in the 1820 Simsbury, Hartford Co., CT, federal census. The household consisted of 1 male 26 to 45, 1 male 16 to 26, 1 male 10 to 16, 2 males under 10, 1 female 26 to 45, 1 female 10 to 16, and 2 females under 10. Alexander appears in the 1830 Simsbury, Hartford Co., CT, federal census. The household contained 1 male aged 40 and under 50, one male 15 and under 20, one male 10 and under 15, one male 5 and under 10, 1 female 40 and under 50, one female 10 and under 15, and one female under 5. Alexanderserved as justice of the peace Granby Hartford County (CT Courant June 18 1827). He served as justice of the peace Simsbury Hartford County Hartford Courant 6/22/1824. Son Oliver made application for the license to marry to his second spouse which suggests he was blind at that time. Alex and Ascenath were enumerated in the 1850 Middlefield, Geauga Co. OH, federal census. He was 67, she was 59. Jeanette was enumerated nearby. Alex and Asenath along with all of their living children except William Harrison Holcombe removed to Winnebago, IL sometime in 1851. Much of the information on this family is from We Remember People 0f Our Past, Vol 4, by John D. Rowley; viewed on-line at FamilySearch.org. [S25] Hannah McPherson, Holcombe Genealogy, Page 53.2/Item A-4-5-2-3-1-10. [S25] Hannah McPherson, Holcombe Genealogy, Pages 49.2, 53.2; Item A-4-5-2-3-1-10. [S25] Hannah McPherson, Holcombe Genealogy, Page 53.2; Item A-4-5-2-3-1-10. Hilpah Holcombe was born on 15 May 1785 at Granby, Hartford Co., CT. She was the daughter of Hezekiah Holcombe II and Chloe Pinney. Hilpah Holcombe died young. Hilpah Holcombe was born on 8 June 1787 at Granby, Hartford Co., CT. She was the daughter of Hezekiah Holcombe II and Chloe Pinney. Hilpah Holcombe married Erastus Roberts, son of Nathaniel Roberts and Rhoda Woodford, on 21 August 1805. Hilpah Holcombe died in 1820. [S25] Hannah McPherson, Holcombe Genealogy, Page 54.1/Item A-4-5-2-3-1-12. Daniel Bates Holcombe was born on 9 September 1790 at Granby, Hartford Co., CT. He was the son of Hezekiah Holcombe II and Dorothy Bates. [S25] Hannah McPherson, Holcombe Genealogy, Page 54.1/Item A-4-5-2-3-1-13. Daniel Bates was born in 1697. He died in 1736. Chloe Pinney Holcombe was born on 5 August 1769 at Granby, Hartford Co., CT.1 She was the daughter of Hezekiah Holcombe II and Chloe Pinney. Chloe Pinney Holcombe was baptized on 13 May 1770. She died on 19 March 1771 at age 1. Chloe Holcombe was baptized on 13 May 1770. She was born on 16 November 1770 at Granby, Hartford Co., CT. She was the daughter of Hezekiah Holcombe II and Chloe Pinney. Orpha Roberts was born on 16 July 1773. She was the daughter of Nathan Roberts and Rhoda Woodford. Orpha Roberts married Hezekiah Holcombe III, son of Hezekiah Holcombe II and Chloe Pinney, in 1791. Orpha Roberts died on 26 January 1820 at age 46. She was buried on 28 January 1820 at Episcopal Parish Christ's Church, Hartford, Hartford Co., CT.
[S807] Find A Grave, online http://www.findagrave.com, Find A Grave, database and images (https://www.findagrave.com : accessed 07 March 2019), memorial page for James Lanman Holcomb (1855–7 Mar 1861), Find A Grave Memorial no. 66030172, citing Granby Cemetery, Granby, Hartford County, Connecticut, USA ; Maintained by M Cooley (contributor 47154454) . [S233] Granby Cemetery Inscriptions, 1934 unknown repository. 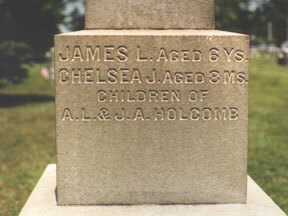 [S807] Find A Grave, online http://www.findagrave.com, Find A Grave, database and images (https://www.findagrave.com : accessed 07 March 2019), memorial page for Chelsea Jones Holcomb (1861–28 Nov 1862), Find A Grave Memorial no. 65162994, citing Granby Cemetery, Granby, Hartford County, Connecticut, USA ; Maintained by M Cooley (contributor 47154454) . Margaret (?) was born circa 1609. She married Edward Griswold, son of George Griswold and Dousabel Leigh, circa 1628 at England. Margaret (?) died on 23 August 1670 at Killingworth (now Clinton), CT.
James Bemis married Sarah Dimond, daughter of John Dimond and Rebecca Bemis. [S116] Esther Griswold French and Robert Lewis French, Griswold, Page 25/Item 13. Joseph Griswold was born on 4 June 1655 at Saybrook, Middlesex Co., CT. He was the son of Francis Griswold and Sarah (?) Joseph Griswold died in July 1655. [S116] Esther Griswold French and Robert Lewis French, Griswold, Page 15/Item 14. [S116] Esther Griswold French and Robert Lewis French, Griswold, Page, 15, 26/Item 15. [S116] Esther Griswold French and Robert Lewis French, Griswold, Page 27/Item 16.